I’ve resisted calls, for a while, to opine on that now obligatory quadrennial exercise of releasing campaign musical playlists for rallies and other events. Obama 2012 issued its lineup in February, engendering a wide range of comment. The Romney campaign has now followed suit, with predictable snickers from the musical punditocracy. It’s hard to win in this game. The creation of campaign playlists or official song contests (which Hillary Clinton’s campaign capitalized on in 2008), is great for Playbook fodder and buzz on the music blogs, but as a useful additive to actual political events and rallies, I never liked the alchemy. First, there are the I.P. and copyright questions, which one presumes Team Obama and Team Romney have worked out before publishing their selections (message to nascent campaigns: proceed with caution and avoid Jackson Browne). But the bigger issue is that political events, especially outdoor Big Crowd events, should affect the audience like a Michael Bay movie or an Andrew Lloyd Webber Broadway show. It should lead with a commanding instrumental overture, not with a lyric-dominated hit by a particular artist. I never liked to overshadow the entrance of my main act with the voice of a bigger rock star. And to achieve maximum effect, the advance team must carefully manage the cadence of the music with a powerful voice-over intro and the candidate’s well-timed — and hopefully elevated — ‘walk-out.’ Then cue the flags and placards. That’s the political equivalent of a theatrical curtain-raising. Some of the best music for these moments are obscure titles found on long-forgotten movie soundtrack CDs. For rallies I produced, taking a cue from one of my mentors, Redmond Walsh, I liked the themes to THE MAGNIFICENT SEVEN, SILVERADO, MR. HOLLAND’S OPUS and Steven Spielberg’s 1941. And there’s even a great original motion picture score from the 1996 Jack Lemmon-James Garner laugher MY FELLOW AMERICANS that I used on several occasions. No one need know the names of the songs, or from whence they came, as long as it was great orchestration. 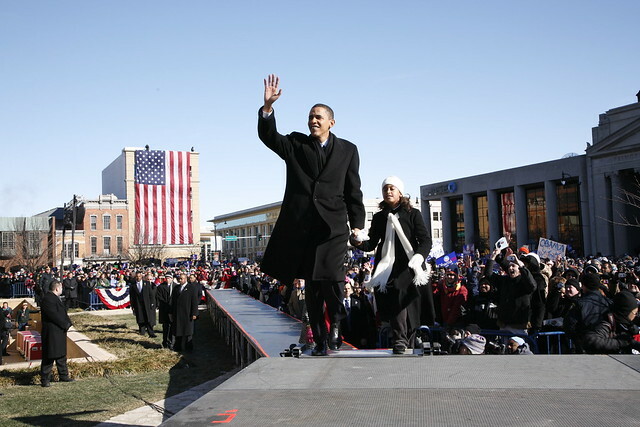 A little-reported fact is that the intro-music heard by perhaps more people than any other political rally in history — President-elect Obama’s appearance in Grant Park in Chicago on November 4, 2008 — was Trevor Rabin’s theme to the 2000 Boaz Yakin picture REMEMBER THE TITANS, a sports yarn whose team-overcoming-race theme also fit well with the historic moment on stage. And few can question that lyrical songs have earned a place in the campaign pantheon. Frank Sinatra’s “High Hopes” (1960) and Fleetwood Mac’s “Don’t Stop” (1992) are synonymous with the victories of John Kennedy and Bill Clinton. But sometimes they fall flat. In 1996, when Clinton’s reelection message was “Building a Bridge to the 21st Century,” I played REO Speedwagon’s “Building The Bridge” at rallies whenever possible. Google the lyrics — they fit Clinton’s message like a glove. But the song never got traction at our rally sites. But here’s another idea that I never followed through on that remains available to the first candidate to reach out to the maestro: commission John Williams to compose your official campaign theme song. The man who scored STAR WARS, INDIANA JONES, HARRY POTTER, the themes for NBC News and the Olympic Games and, most recently, WAR HORSE, still hasn’t been called on to create a campaign anthem for the next President of the United States. Now that would get the crowd stirring.